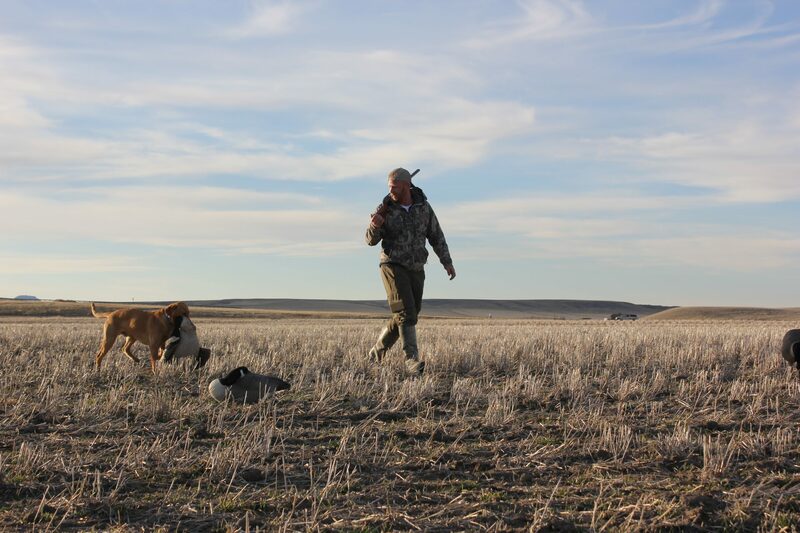 On a last ditch effort to knock some geese out of the sky, we headed North towards Great Falls on a hot tip from the boss. It was the last weekend of hunting the massive flocks of geese, so we were rolling by 6:30 in the morning. As first lite started coming over the mountains, we could see the hundreds of birds in the air in the magnificent V-pattern. My buddy happened to be checking OnX maps (a property/satellite map for your phone) when we cruised by a field with easily a couple hundred geese feeding. As it turns out, the field was public and legal to hunt so we changed our plans a bit. We turned around and headed back to check that field out to be completely sure. Once we were positive it was huntable, we didn’t want to spook all the birds in the field and thought we would save it for Sunday morning. We ended up throwing some duck decoys in some backwater of the Missouri River just across the road. We sat for around 3 hours with no luck, although the flocks of geese were coming back to roost just on the other side of the river, never giving us a close enough shot. After seeing all the geese coming back to the river, we thought it would be a good time to jump on the field, hoping not as many birds were on it. We left the river and rushed to the other side of the road toting a mess of decoys a few hundred yards to the field to set up. We only spooked a handful of birds but knew they would be back that night to feed. 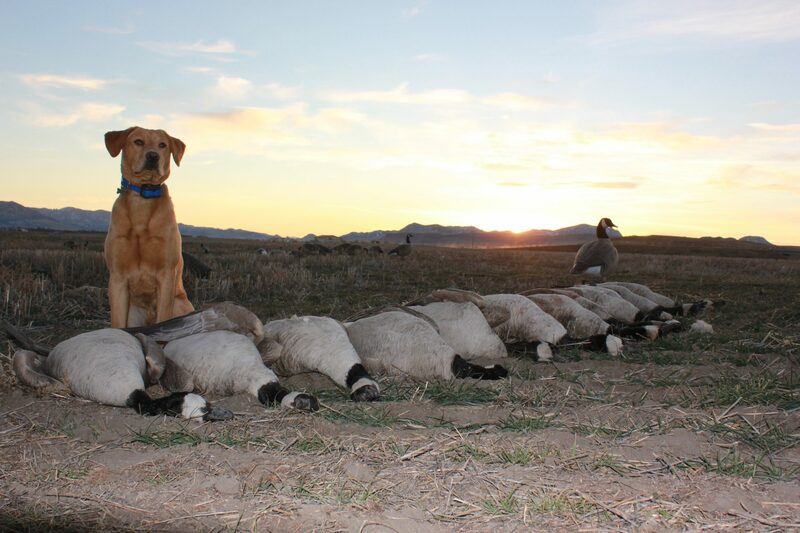 We made our set of decoys and brushed in a 3 person blind using tumbleweed and a corner fence post and topped it off with whatever other kind of grass we could find. It started out slow, but after half an hour waiting, they started to pour into the fields. It was one flock after the next, and sometimes we didn’t even have time to grab the downed birds in the field before the next flock of 6 or 7 put their landing gears on to settle in the field. At times, our young dog, Brooks, was hauling through the field chasing a wounded goose and doing the best he could to bring it back (geese are the same size as him at this point). After just 2 hours, we had a 3 man limit of 12 birds and a few boxes of shells were bone dry. We had to make a trip that night into Great Falls to grab more shells for the next day. We got to the field well before sunrise the next morning and were ready to go before sun up. It was much slower in the morning only having one flock come in and downing 2. So there we sat for the next 6 hours living off donuts and elk jerky until the birds started to move again. Around 3:00 in the afternoon, the bigger groups started to split up making it easier to fool a handful of birds at a time. We ended up with 10 more for the day on the account of poor shooting. But all in all, it was a great weekend and the ol’ boom-stick got a great workout in! Explore Rentals is the original outdoor gear rental agency in greater Yellowstone region. Our goal has always been to provide the best possible rental gear for outdoor adventures. With well over 200 different types of outdoor rentals for outdoor adventures, we certainly have an something that will make your Montana experience more fun, safe, and comfortable. Our location next to the Bozeman Airport, with after-hours pick-up and drop-offs possible, allows for tremendous convenience with no waiting in line, and no hassle of dealing with shipping- ever.